Our design team will work with you to create a unique email template that matches your branding, personality and product offering. Whilst we recommend certain components to be included you do have free reign over both the look-and-feel and well as the content of your custom-designed email template. Make an impact on your customer immediately with a punchy welcome message. We suggest you include all your calls-to-action in the text where possible. Allow your customers to complete standard requests like booking a test drive, obtaining a price for their trade-in vehicle, requesting a call back from you or applying for finance. Each request is automatically logged and you are emailed the details. Allow the customer to identify quickly that you offer finance. We automatically calculate indicative weekly finance repayments based on the vehicles sale price and your finance parameters. 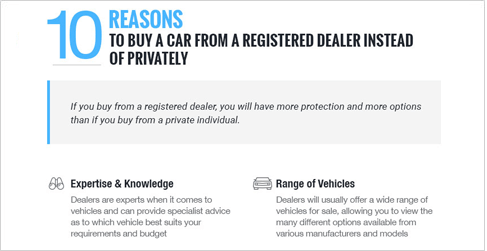 Alert your customers to the benefits of buying from a dealer as opposed to privately. Entice your customer to further the sales process by offering an incentive to book a test drive for example. Have a workshop or offer another service? 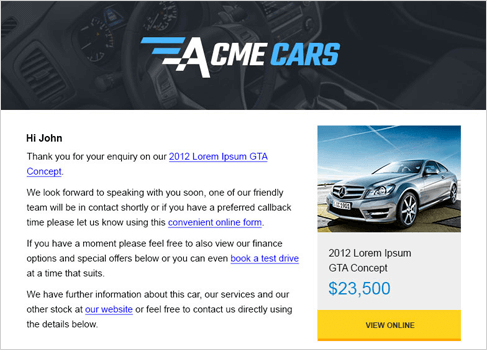 Use this panel to alert your customers that you don't just sell vehicles. Explain to your customers what makes your dealership different. 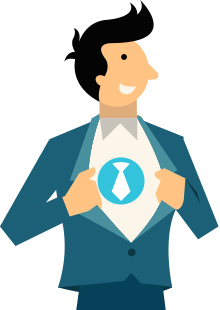 Allow key staff to be recognised with photos and contacted easily with their own details.